Single family stone chalet with beautiful wood interior. In walking distance to shops in Riva Valdobbia and nestled in a quiet and private location. Has outside porch and sunny garden area. Comfortably sleeps 8/9 people with two full baths - one of which has a jacuzzi tub. Large panoramic windows with breathtaking mountain views from the living area. Fire place and outside grill. In addition to three bedrooms the chalet also has a comfortable loft with star gazing and mountain views from the skylight. I am a mountain guide and resident of the Valsesia. I travel a lot for work so happy to share my property with other people visiting the valley. This is a very relaxing spot in a valley that has not yet been overrun by tourism. Some of the best skiing, mountain climbing, fishing of Northern Italy can be found here. This property is a blend of old and new. 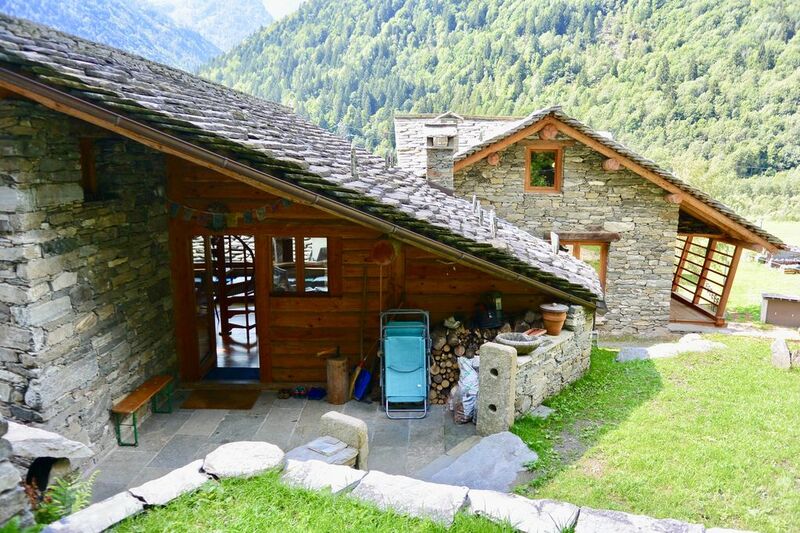 With all the modern amenities it is situated in a pristine and untouched 16th century mountain hamlet in the valsesia valley of Northern Italy..
Casa stupenda, con ampia vetrata su montagne, da rimanere incantati. Casa molto confortevole e comoda per vari aspetti. Grazie Giuseppe! E' stato un piacere ospitarvi!! grande e accogliente, completa di tutto, delicata non adatta ragazzini, in frazione antica walser. Grazie Paolo - siete stati ospiti di grande qualità. Effettivamente la baita si presta bene per due famiglie. Grazie di averla lasciata come l’avete trovata!